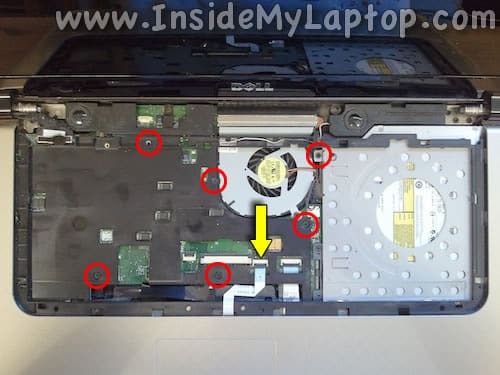 In this guide I will show how to disassemble a Dell Studio 1569. 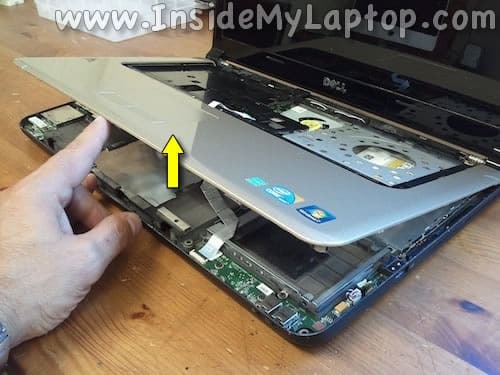 Before you start, make sure the laptop is turned off. Loosen two screws securing the RAM cover. 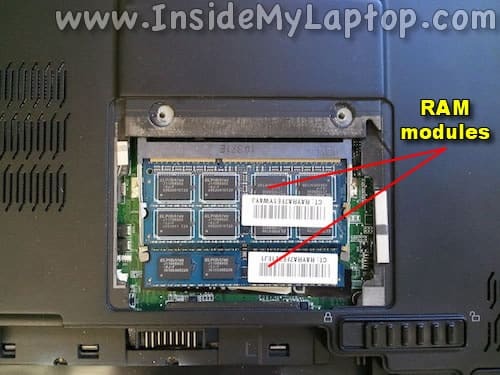 Under the cover you will find both RAM modules. 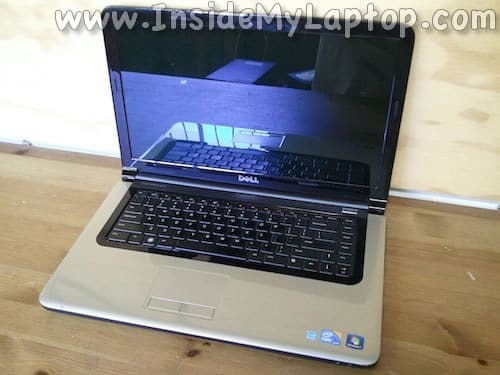 Dell Studio 1569 uses DDR3 1066/1333 MHz modules and can take up to 8GB RAM total (up to 4GB module in each slot). 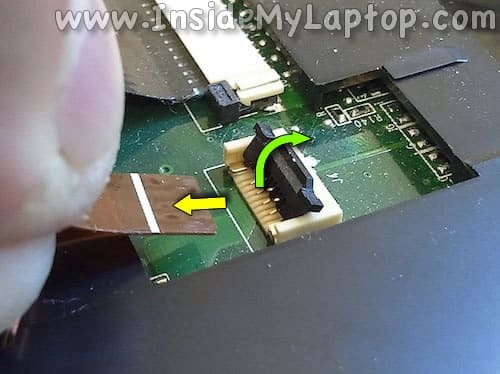 Loosen two screws securing the wireless card cover. 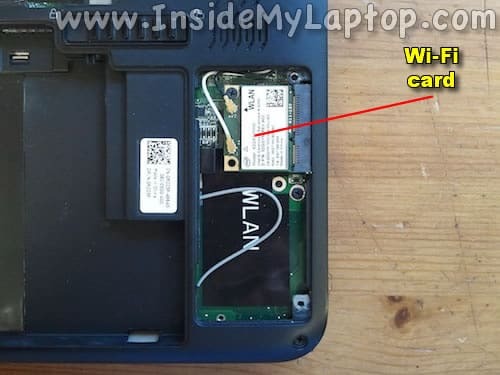 If you need to remove the Wi-Fi card you’ll have to disconnect two antenna cables and remove one screw securing the card. 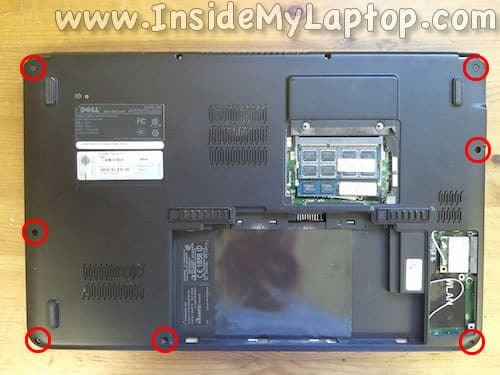 Remove two screws securing the power button cover. 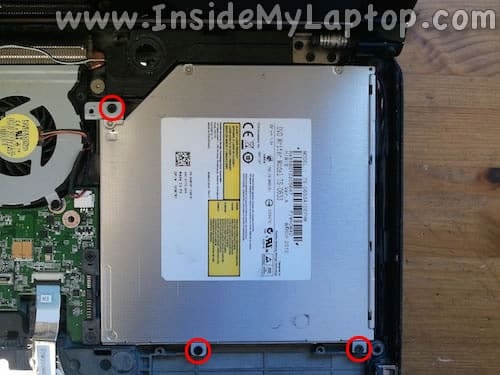 Start removing the cover as it shown on the following picture. 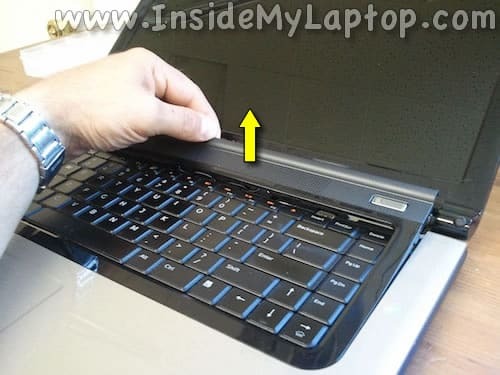 You’ll have to wiggle the cover on sides to disengage hidden tabs. 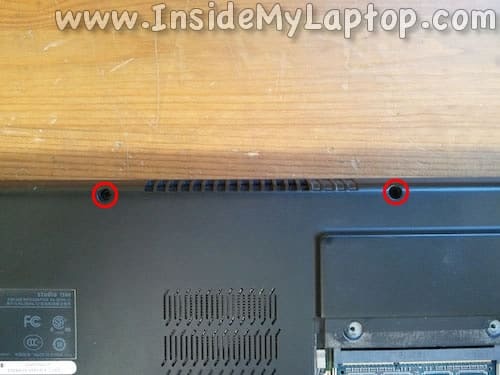 Be careful, the power button cable (attached to the cover) still connected to the motherboard. 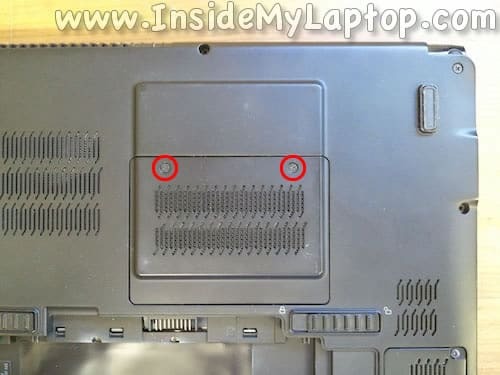 Unplug the power button cable from the connector. 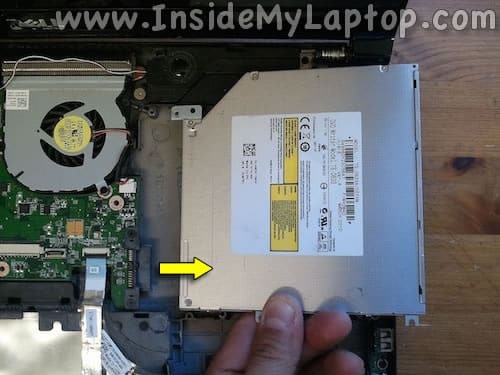 Now you can remove the cover completely. 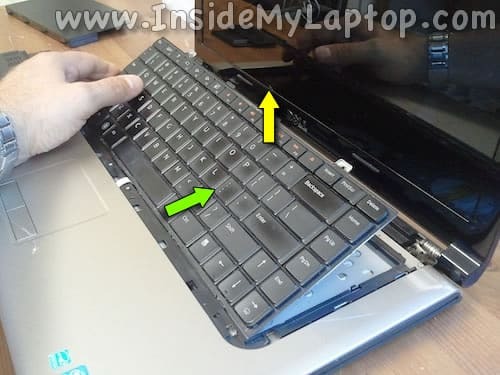 Separate the keyboard from the palm rest assembly. 1. Slide the keyboard towards the display. 2. Lift up the keyboard. Yellow arrow – backlight cable. Green arrow – data cable. 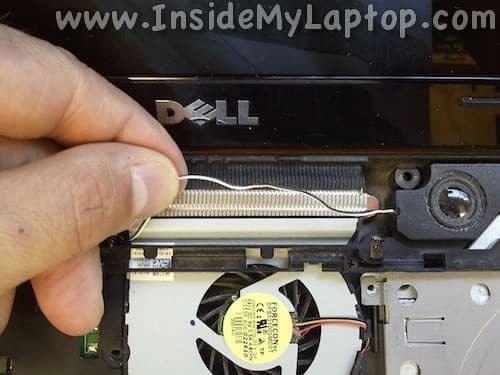 Here’s how to disconnect the backlight cable. 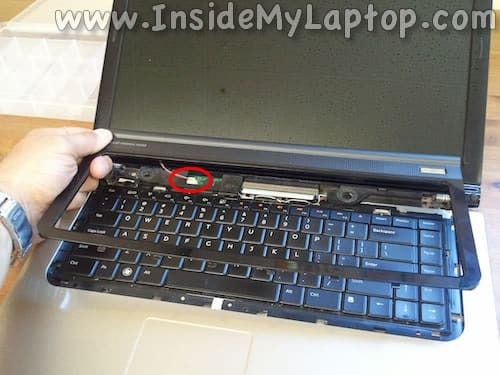 Lift up the left side of the locking tab until it opens up at a 90 degree angle (green arrow). 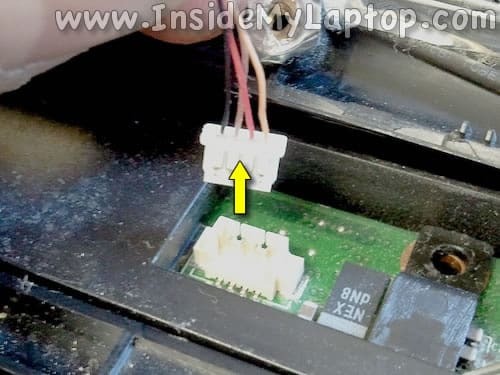 Pull the cable from the connector (yellow arrow). 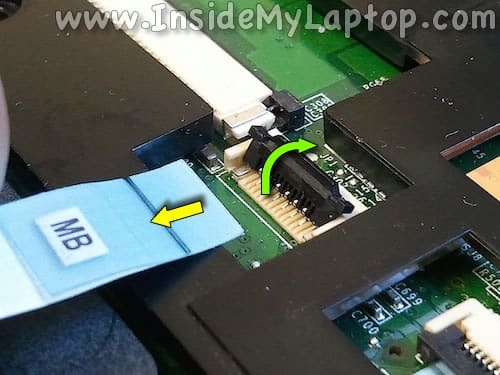 Here’s how to disconnect the data cable. Slide the retainer about 2 millimeters away from the connector base (two green arrows). 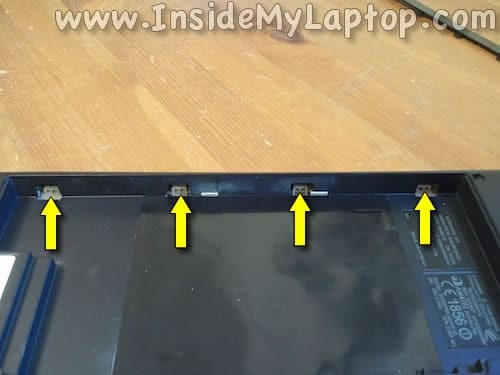 Remove seven screws from the bottom of the laptop. Remove six screws securing the top cover. 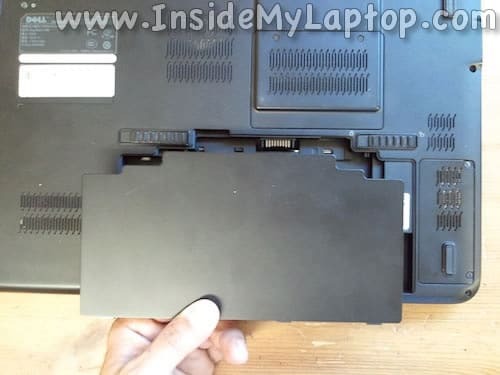 In the battery compartment you will find four tabs securing the palm rest to the bottom cover. 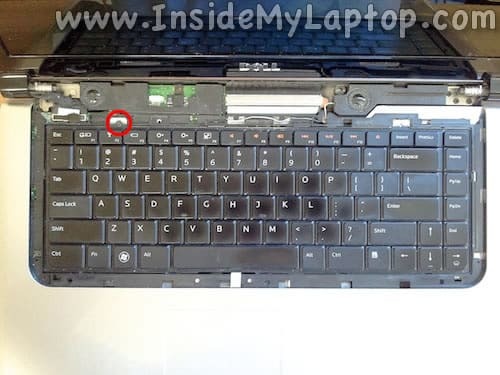 Push on tabs with a plastic stick to disengage them. Start separating the palm rest from the bottom cover. 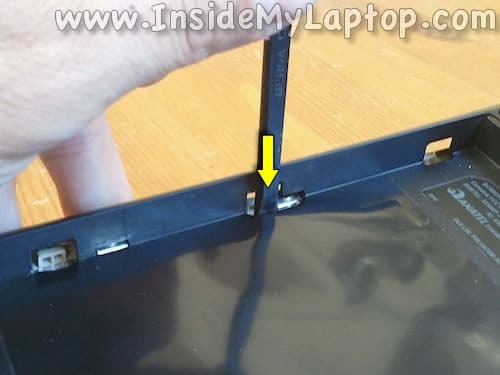 Don’t forget to un-route the speaker cable from the palm rest assembly. It’s located just above the fan. 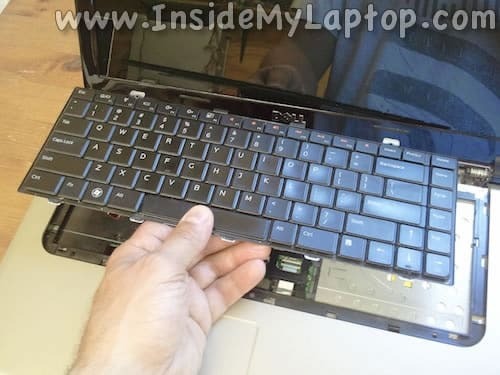 Remove the palm rest assembly. 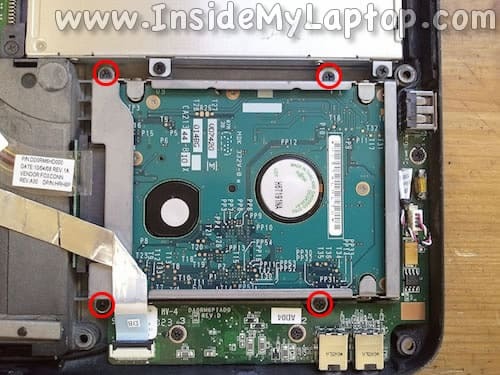 Remove four screws securing the hard drive caddy. 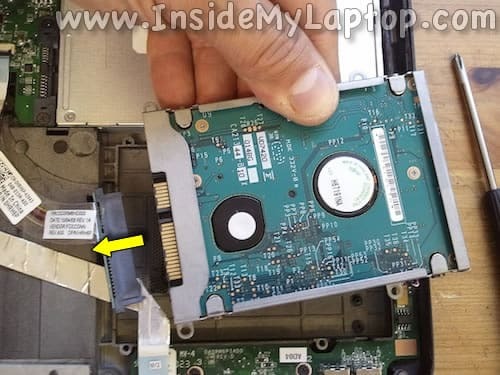 Lift up the hard drive assembly from the laptop case and disconnect the SATA cable. 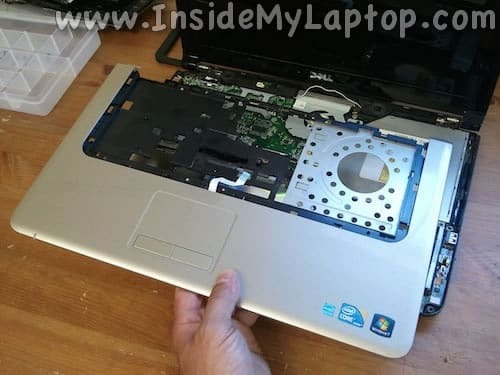 Now you can replace or upgrade the hard drive if necessary. 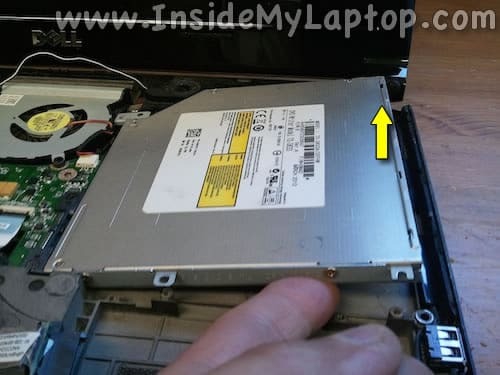 Remove three screws securing the optical DVD drive. 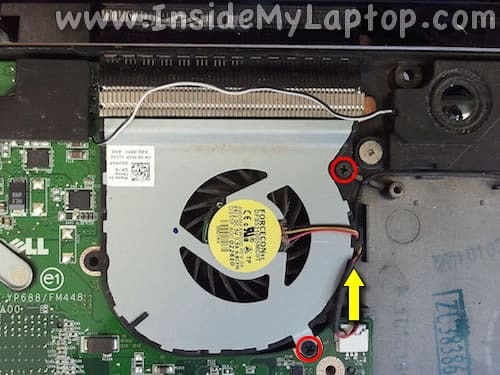 Lift up the right side of the optical drive. 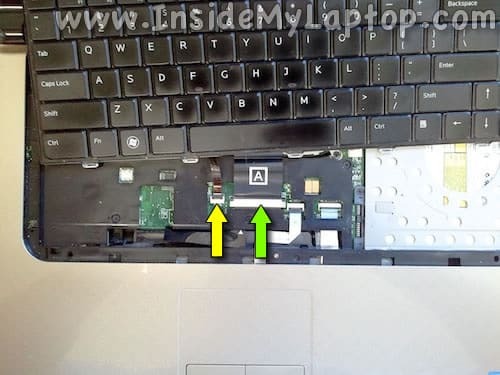 Pull the optical drive to the right to disconnect it from the motherboard. Now it can be replaced or cleaned up. 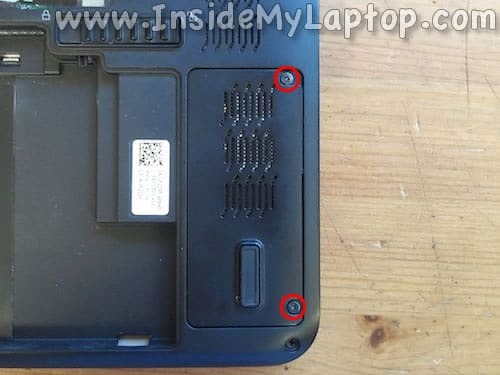 Remove one screw securing the Bluetooth card. 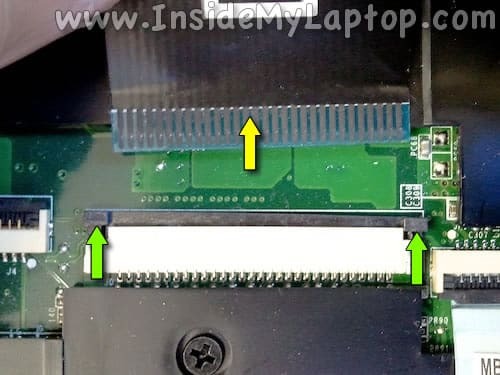 Lift up the card to disconnect it from the motherboard. Nice work. My hard drive crashed this weekend. Sad to hear I have to disassemble the entire thing to get to my hard drive. Well done! I replaced my drive with a SSD. It would have been a nightmare without these detailed steps.